Home / Napoleonic Army / Forlorn Hope. Comments Off on Forlorn Hope. 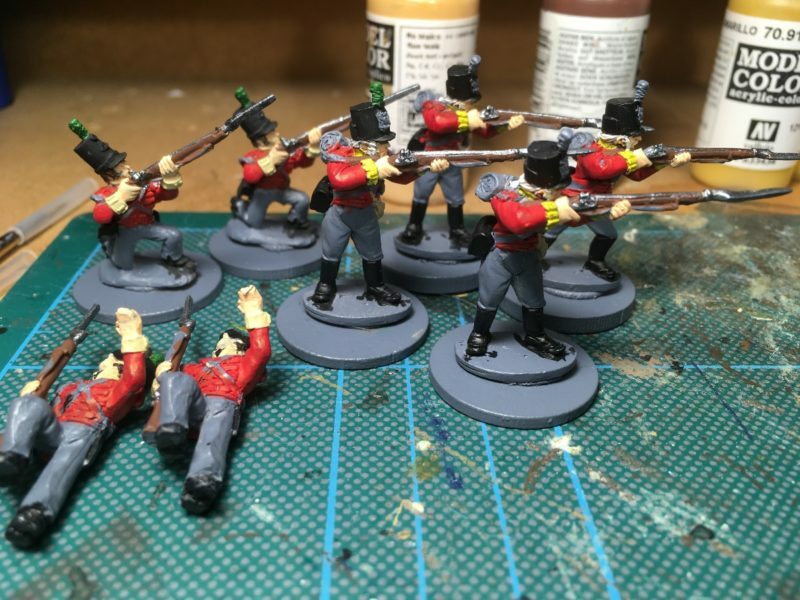 Napoleonic Army, Whats on the work bench? My painting this week has been a bit hit and miss. That said, I have still found plenty to do, sometimes you have to go backwards to go forwards. So I’ve been tidying, dusting, researching and preparing a couple of projects for the future. One of those projects is in support of the Bingham Napoleonic day to be held on 2nd March. 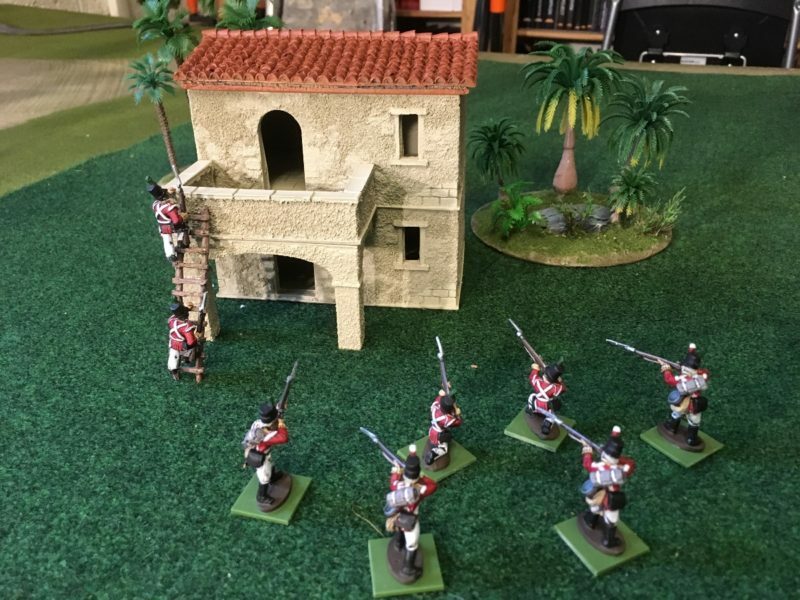 I’ll post a link at the end of this blog to the event itself, but it involves a small Napoleonic demo game set in the Peninsular War. This was a good excuse for another dive into the lead pile to see what I had that would be suitable. 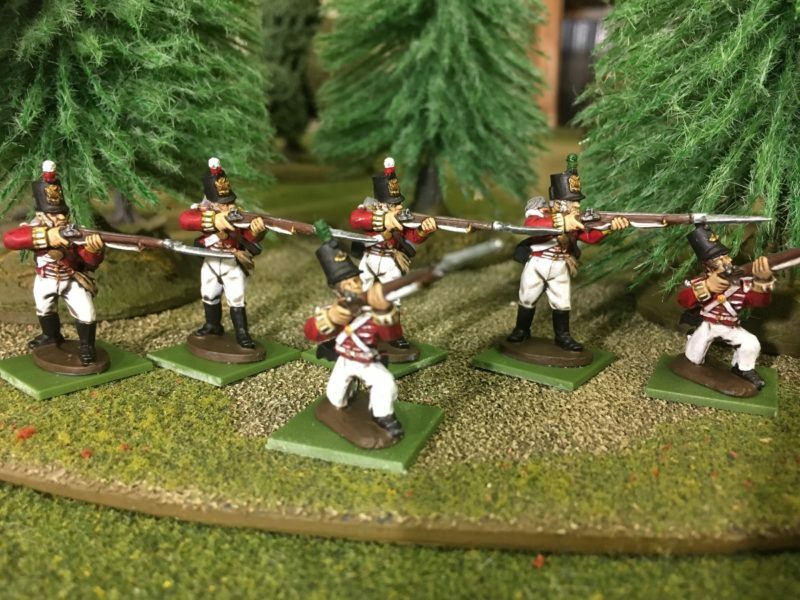 I found a few Foundry Peninsular Light infantry and the limited Edition Warlord Games Ensign that came with the first Black powder supplement, Albion Triumphant ! I actually had about 20 figures but decided to focus on just eight, leaving the ensign to one side for the time being, as the rest lent themselves to a quick batch paint. I used my tried and trusted approach to painting, working from the inside out, to block paint the various colours. Flesh first for hands & face; Black hats, boots cartridge cases & bayonet scabbards; Iraqi Sand Bread bags; Pastel Blue water bottles; Flat brown for muskets. It was only during preparation that I noticed there were some differences in the figures. 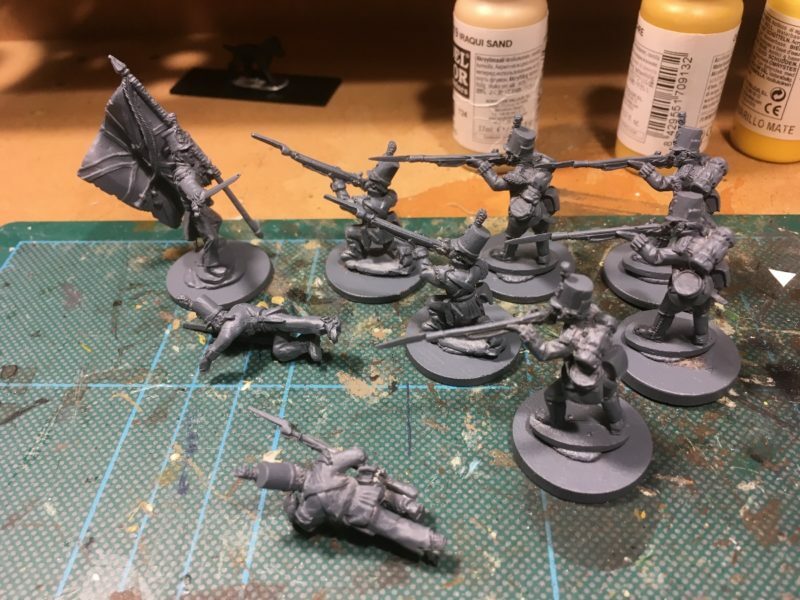 Four of them are clearly light infantry ( kneeling and climbing), four are line infantry but in light kit. Also, these final four are clearly very early Peninsular uniforms. 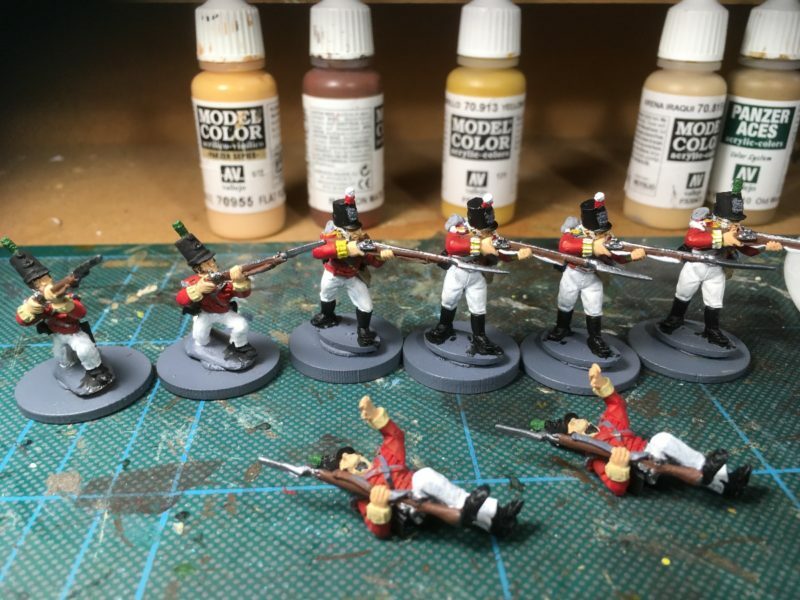 The early Peninsular chaps still had their hair in the ‘queue’, so I followed the colour scheme for the 29th Infantry 1808 ( Worcestershire Regt) from the book ‘Military Dress of the Peninsular War’. 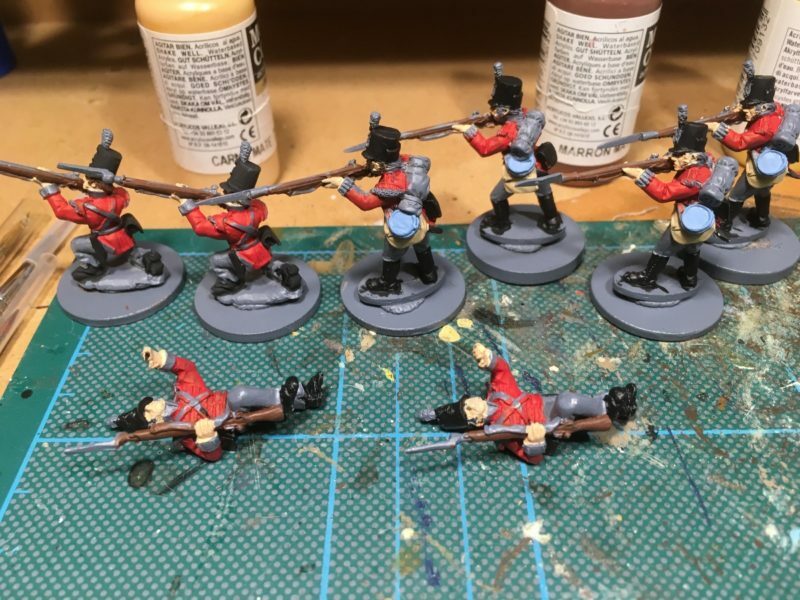 The others I painted as 52nd light infantry. As they are intended to be part of a ‘Forlon Hope’ assaulting a village somewhere in Spain, I’m not too worried that they will be from different regiments. In the same casual approach that I have adopted for the new year, I’m not going to get too excited about the differences in uniform. It will make a nice conversation piece at the game, should any one notice! The picture above shows the figures nearly completed – at this point, I just needed to paint the lace and cross belts, brass for the buttons and buckles and touch up any obvious mistakes. The final step would be to paint them in Army Painter quick shade, matt varnish them and then re paint and highlight the lighter colours. The picture above shows the completed figures. Of course the next step is to base them but I am waiting to see how our demo board looks before proceeding. As you can see, the next project is to finish a house for the board. It may be that we don’t actually use the house. It was originally bought for my Caribbean project but the building looks ‘Spanish’ enough for both the Caribbean and the Peninsular, so whether it’s used or not, it will be another useful edition to my collection. So, I’ll go back and finish that Ensign and following a meeting planned tonight, I may need to paint a few more figures for the game. I also need to do quite a bit of work to finish the house, so the next few weeks look busy! 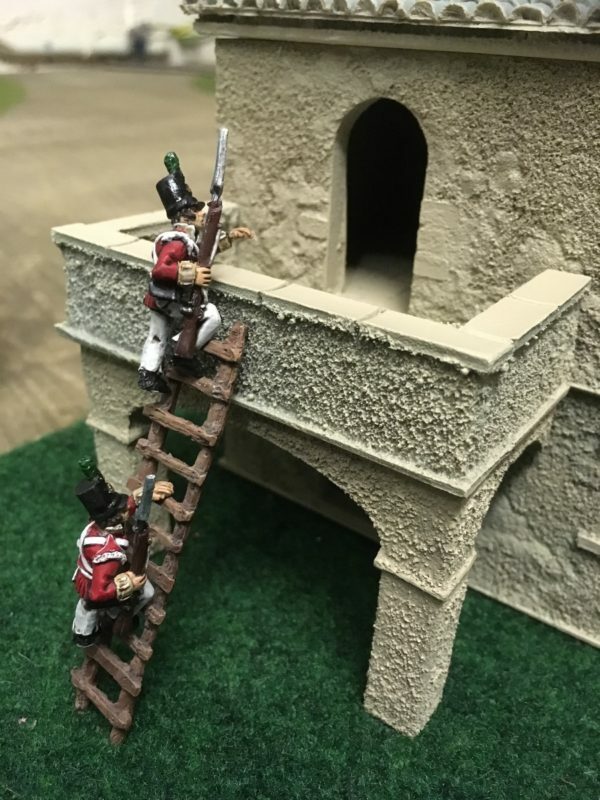 Although the figures are not available from Arcane Scenery ( I think some of them may be OOP) all of the finishing products are, even better, we send post free!